For the first time, scientists have directly detected gravitational waves — ripples in space-time — in conjunction with light from the spectacular collision of two neutron stars. This marks the first time that a cosmic event has been viewed in both gravitational waves and light. The gravitational signal, named GW170817, was first detected on August 17 at 8:41 am EDT by two identical Laser Interferometer Gravitational-Wave Observatory (LIGO) detectors, one located in Hanford, Washington, and one in Livingston, Louisiana. The information provided by the third detector, Virgo, situated near Pisa, Italy, enabled an improvement in localizing the cosmic event. Each LIGO observatory consists of two long tunnels arranged in an L shape, at the joint of which a laser beam is split in two. Light is sent down the length of each tunnel, then reflected in the direction it came from by a suspended mirror. In the absence of gravitational waves, the laser light in each tunnel should return to the location where the beams were split at precisely the same time. If a gravitational wave passes through the observatory, it will alter each laser beam’s arrival time, creating an almost imperceptible change in the observatory’s output signal. 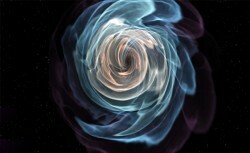 As these neutron stars spiraled together, they emitted gravitational waves that were detectable for about 100 seconds. When they collided, a flash of light in the form of gamma rays was emitted and seen on Earth about two seconds after the gravitational waves. In the days and weeks following the smashup, other forms of light, or electromagnetic radiation — including X-ray, ultraviolet, optical, infrared, and radio waves — were detected. On August 17, LIGO’s real-time data analysis software caught a strong signal of gravitational waves from space in one of the two LIGO detectors. At nearly the same time, the Gamma-ray Burst Monitor on NASA’s Fermi space telescope had detected a burst of gamma rays. LIGO-Virgo analysis software put the two signals together and saw it was highly unlikely to be a chance coincidence, and another automated LIGO analysis indicated that there was a coincident gravitational wave signal in the other LIGO detector. The collaboration between LIGO and Virgo determine the statistical significance of detected waves on OSG. This is done via the pyCBC pipeline that uses Pegasus and HTCondor as part of its implementation, notes Peter F. Couvares of the LIGO Laboratory at Caltech. While binary black holes produce 'chirps' lasting a fraction of a second in the LIGO detector’s sensitive band, the August 17 chirp lasted approximately 100 seconds and was seen through the entire frequency range of LIGO — about the same range as common musical instruments. Scientists could identify the chirp source as objects that were much less massive than the black holes seen to date. “It immediately appeared to us the source was likely to be neutron stars, the other coveted source we were hoping to see — and promising the world we would see,” says David Shoemaker, spokesperson for the LIGO Scientific Collaboration and senior research scientist in the Massachusetts Institute of Technology’s Kavli Institute for Astrophysics and Space Research.